Gambio, with its growing merchant base, is in a unique position to lead the industry into a sustainable alternative to Amazon, based on open-source software powered by blockchain technology. We firmly believe that merchants need to be empowered in order to provide the best products and services to consumers. Gambio is the market leader for e-commerce software in Germany , and has a long-lasting history of generating profitable business in the industry. The Gambio holding based in Zug, Switzerland has five subsidiaries, and employs more than 50 employees, most of them being developers and engineers. GAMB’s vision is to become the decentralized marketplace of the future, governed by smart contracts, and with no decision making entity other than the stakeholders. Only the Merchant Alliance members (token holders) will define rules and regulations, and program them into smart contracts, guaranteeing transparency, trust and sustainability. A functional portion of the the proposed marketplace can be deployed within the next 12 months. Provided milestones will outlay full decentralization of the system afterwards. Advancement of blockchain technology will accelerate the transition to full decentralisation, which will be managed by an organization aligned with the vision of GAMB. The objective is to start building the future of e-commerce today, without a negative impact on performance or user experience. This can only be achieved by carefully analyzing all components of a decentralized marketplace and successfully migrating to a blockchain environment. 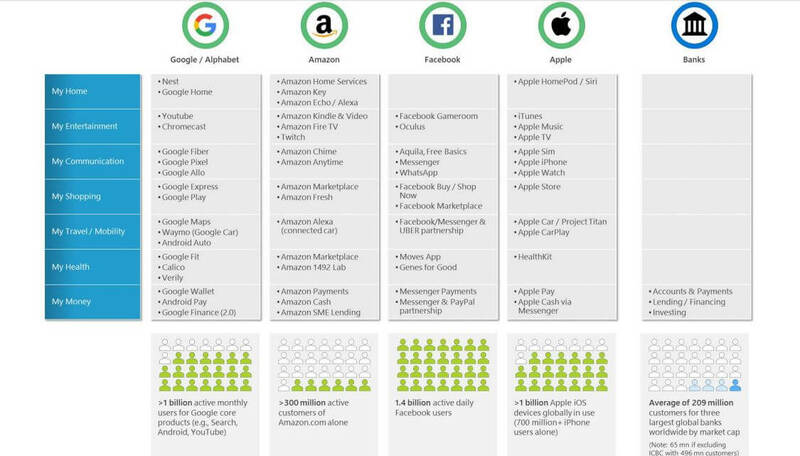 The world is witnessing an unprecedented centralization of economic power by leading tech companies such as Google, Amazon, Facebook and Apple (GAFA). Presently, an astonishing 83% of all product searches start with either Amazon or Google. Every second book in the United States is sold via Amazon, who also controls the e-commerce infrastructure: globally more than 4 million merchants use the Amazon marketplace and underlying services as sales channel. This market dominating position allows Amazon to dictate prices and terms and conditions to use their services, factually subordinating merchants across the globe. Apple alone has accumulated 261 billion US Dollars in cash reserves, an amount greater than the expected gross domestic product of countries like Finland in 2017. In addition, the immense cash reserves of the four tech giants intensify the centralization dynamic: competition can simply be acquired or copied (e.g. Facebook copying services from Snap, Inc. leading to a 50% decrease in company valuation of Snap within one year), thus accumulating more power in adjacent industries as depicted in Figure 1. For online and offline merchants alike, the market position of Amazon is a real threat, as long as the dependence of merchants on Amazon remains unchanged. Merchants selling via Amazon can be blocked and driven out of business, successful products can be sold directly by Amazon and prices for advertising to drive traffic to one’s products can be dictated. While the online share of retail trade is constantly growing, the power of Amazon will increase along with the trend. From a merchant perspective (third party sellers), Amazon has consistently raised fees on warehousing and storage costs, as well as shipping fees. These increases typically occur twice a year, and have had a tremendously negative effect on the margins of third-party sellers by continually transferring additional expenses onto third party sellers, while more margins are achieved by Amazon. In Germany for example, the share of online sales has increased from 11,6% in 2015 to 15,1% in 2017 and a continuation of this trend is expected. This vicious circle of centralization power must be broken. Decentralization — Power to the Merchants. Gambio has developed an intuitive all-in-one e-commerce solution. In more than 10 years, this open-source software has constantly been improved to solve our merchant’s needs. As of today, it is is very flexible and available as self-hosted and cloud version. With its growing merchant base of more than 25,000 active online stores is in a unique position to lead the industry into a sustainable alternative to Amazon, based on open-source software powered by blockchain technology. We firmly believe that merchants need to be empowered in order to provide the best products and the best services to consumers. The best alternative is a decentralized, organized marketplace which will in the future be controlled by merchants themselves. Decisions regarding features and services as well as cost and fee structures will not be forced upon merchants anymore. Instead, they will decide amongst themselves in a decentral autonomous organization (DAO). The concept of a merchant alliance serves as strong basis to build the organizational structure to define the marketplace. Merchants across the globe become members of this alliance and thus participate in the decision-making process, simply by owning Gambio tokens. 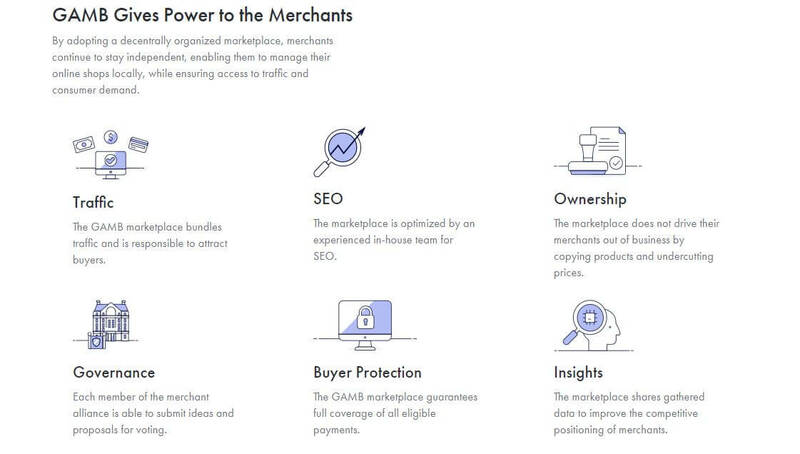 By adopting our vision of a decentralized organized marketplace, merchants continue to stay independent, enabling them to manage their online shops locally, while ensuring access to traffic and consumer demand through deep marketplace integrations, and the membership in the merchant alliance globally. An integrated interface enables Gambio merchants to list their products on the marketplace, comparable to Google shopping. In future, this will be a platform agnostic e-commerce solution to allow any merchant to list their products, regardless of the software solution at hand. In fact, we invite and encourage software providers across the globe to join our cause and to support their customers with the connection to this decentralized organized marketplace. Website launched; First version of whitepaper released. ICO successfully closed; Release: Name and brand of marketplace; Opening of pre-registration for merchants. Closed alpha: definition of and product search engine MVP; Open beta: product search engine MVP; Release: product search engine 1.0. Release: marketplace connector API; Release: merchant alliance governance backend MVP. Release Beta: marketplace MVP (product search / order management). Onboarding of 9,000 Spanish merchants and expansion into Spain. Onboarding of 13,000 French merchants and expansion into France. Onboarding of merchant base in Poland, Italy and UK. Onboarding of merchant base in Sweden, Denmark, Netherland and Belgium. Onboarding of merchant base in Turkey & Malaysia.